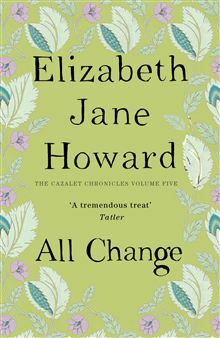 A leap forward in time; the fourth book in The Cazalet Chronicles by Elizabeth Jane Howard left us in 1947 but this, the last in the series, runs from June 1956 to December 1958. Much has changed in the 11 years after VE Day: Queen Elizabeth succeeds to the throne after the death of her father King George VI, there are eight million refugees within Germany’s borders, President Eisenhower is elected. And in the world of the Cazalets, The Duchy dies. This final book is an examination of the nature of love that persists despite pain and trouble. The cousins experience difficulties in love – affairs, divorce, misguided attachments and betrayal – while their parents are fractured by the failure of the family timber business. Suddenly there is no money: houses must be sold, servants let go after years of service, meals cooked and houses cleaned without help. Family love persists through this dark time and, as throughout the war, the Cazalet family emerges out the other side, shaped differently for the next decade. Reading the last book in a well-loved series is always a mixed feeling: delight and loss. So it is with wonder that I consider how Elizabeth Jane Howard wrote this final book of the series when she was 90, completing it before she died in January 2014.